lessons from this very talented musician! In this set of lessons, Hunter Perrin will teach you the rockabilly stylings of Sun Studio. Hunter will first introduce the style then talk a bit about the gear and tone; then he'll demonstrate an acoustic backbeat rhythm. Following that is a cool electric rhythm approach, then a lead guitar part in the style of Scotty Moore. We'll put it all together in the end for a play along. In this set of lessons, Hunter Perrin will teach "Get Rhythm", by Johnny Cash. We'll start with a song overview and the gear and tone, then get into the chorus acoustic and electric parts. Next is the verse rhythms, then the acoustic part under the solo; we'll take on the second chorus before we learn the solo. The verse and chorus parts for both guitars towards the end of the song all come next, then we'll do full and single guitar performances and a jam along to conclude. In this series of lessons, Hunter Perrin is going to teach you "Gimme Three Steps", by Lynyrd Skynyrd. Hunter will go over the lessons then delve into the gear and tone a bit, then he'll break down the cool intro riffing and lead. We'll learn the verse rhythm before we take on the 1st solo, then get into the chorus rhythm. The 2nd solo comes next, then the outro solo; we'll tie things up with a play along performance and a jam along. In this set of lessons, Hunter Perrin will teach "High Cotton", by Alabama. After a song introduction and the gear and tone, Hunter will get into the fingerstyle parts for the intro and verse. Next we'll learn the boom-chick strumming in the chorus and during the fiddle solo; then we'll look at the verse rhythms and chords. We'll learn the modulated chorus before we move to the play along performance, then you'll take over in the jam along. In this set of lessons, Hunter Perrin will teach you "I Hear You Knockin'", as made famous by Dave Edmunds. To start, we'll introduce the song and talk about gear and tone - then get into the intro lead and rhythm parts. We'll learn the rhythm and slide guitar for the verse before we get into the solos and rhythm. Next is the last verse, then the fade out; then we'll do full and single guitar performances and a jam along. 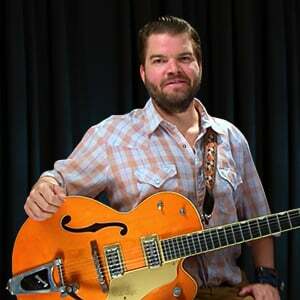 In this tutorial, Hunter Perrin will teach you "Rebel Rouser", by Duane Eddy. Hunter will give a song overview, then talk about the gear and tone; then he'll break down the classic melody and rhythm parts in E. After that, we'll learn those same parts as they modulate to F, F#, and then G. We'll conclude with a full performance, a single guitar performance, then you'll take over in the jam along. In this set of lessons, Hunter Perrin will teach "Why Can't We Be Friends", by War. Hunter will give a brief introduction to the song and a glance at gear and tones before he gets into the details of the first chord progression in the tune. After that, we'll get into the second chord progression; then we'll do a play along performance. We conclude with a "guitar karaoke" jam along where you take center stage.